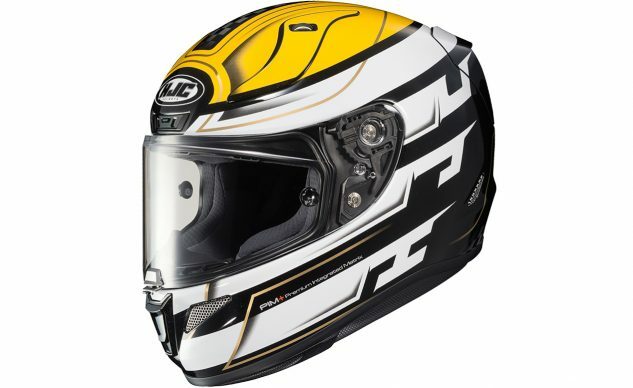 HJC’s new top-line full-face helmet is here, and it is a pip, Alice. 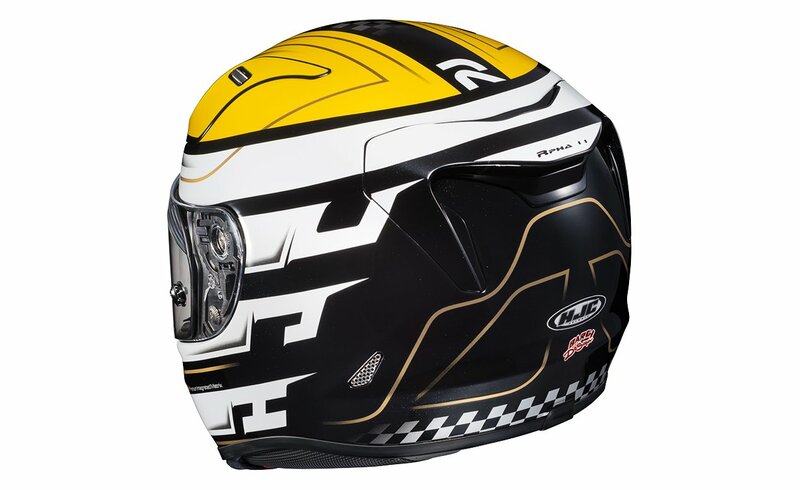 Long known as a reliable maker of high-quality helmets that are still affordable, the RPHA 11 PRO moves HJC one more step closer to the premium lids. And while its price tag has bumped up accordingly, $449.99 for this helmet still seems like a bargain. 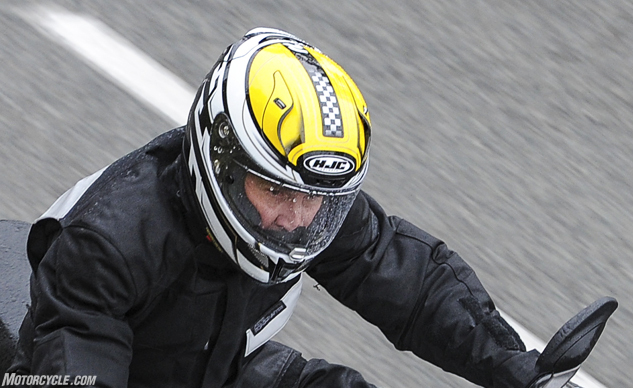 HJC’s first RPHA helmets got here in 2012, featuring its Premium Integrated Matrix Plus (PIM+) construction for a really light shell, smooth aerodynamics and comfort. The RPHA 11 Pro supersedes it, still using that carbon fiber/aramid/fiberglass/organic non-woven fabric shell, and now adding an enlarged eye port in a more aerodynamic shell (HJC has its own wind tunnel). Another thing that’s really nice when you’re going that fast or for a long time is light weight, and this one’s got that going on for it too: 3 pounds, 3 ounces says my local postal scale, compared to 3 lbs, 8.5 oz for a new Arai Corsair X I brought along for comparison. I think that’s 11% lighter. And before COTA, I packed this one along to ride in on the new Ducati Monster 797. I packed contact lenses too because I knew it was going to rain, and you know what a problem rain, mist, and looking through two layers of plastic can be. As luck would have it, the shield sealed so well I had zero leakage inside, and the breath diffuser kept me from fogging up, too. 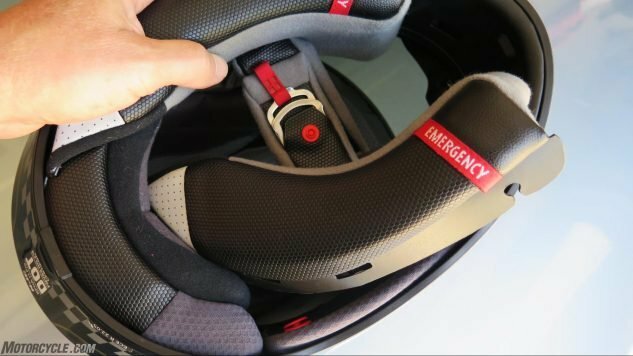 A little snap deal at the middle bottom of the shield seals it positively closed, and it’s easy to pop open when you want fresh air. Oh yeah, the RPHA 11 Pro comes with a clear shield and a dark one (and an anti-fog insert I failed to insert before the damp Ducati ride). A chimp could change the shields. 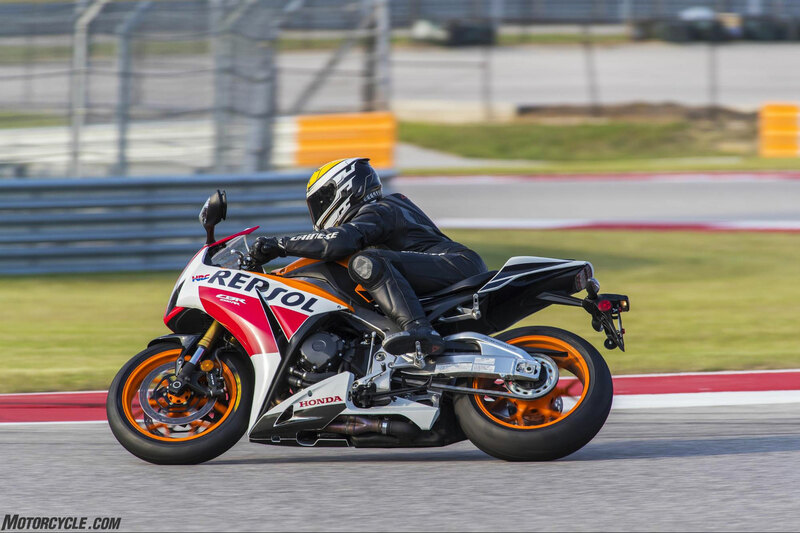 To be perfectly honest I didn’t realize HJC had sent me its latest and greatest until I was riding a CBR1000RR down the long back straight at COTA the other day, and noticed as I was hunkered down “behind the Perspex bubble,” as the old Brit announcers used to constantly announce, I could totally see where I was going thanks to the new higher eye port. Which is nice when you’re going that fast and not sure exactly which is the right direction. The helmet is super-snug and stable in 150-mph breezes too. Venting? Yes of course, starring HJC’s new and improved Advanced Channeling Ventilation system, and now with a new forehead vent. There’s another pair of vents on the chinbar you can open and close. Overall I give this one a solid B for airflow. Not bad but not the best. 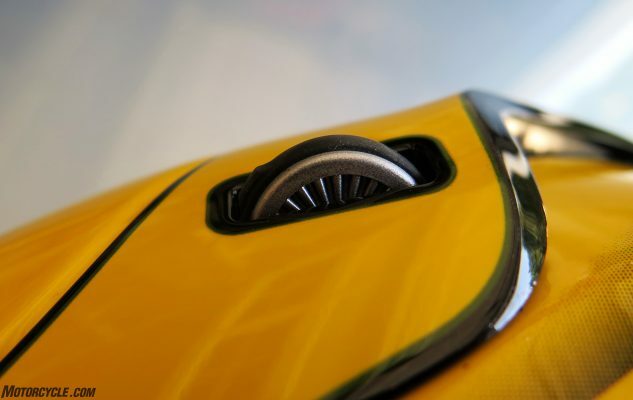 These rotary intake vent controls on top, complete with wee rubber tires, are one example of RPHA attention to detail. Easy to feel and adjust with gloves on. When it comes to fit, though, which is the most important thing in a helmet for me, this one is right up there with the best – somewhere between the classic Shoei RF1200 and I have to say, slightly above the intermediate oval Arai Corsair X (Arai’s best attempt at fitting my Scottish/Irish/German mongrel head), whose retail price is about twice that of the HJC. Cheek pads come in 5mm increments to allow a custom fit, and pop out easily in case of emergency. (They don’t pop back in so easy.) Of course it’s all anti-fungal wicking and all that, and there are recesses for speakers. I’ve had no problems not finishing MotoGP races because of any helmet malfunctions so far, and no complaints from HJC’s sponsored rider Jonas Folger on his Tech 3 Yamaha either. The roughest thing about this helmet is its nomenclature; RPHA 11 Pro SKYRYM is quite a mouthful. 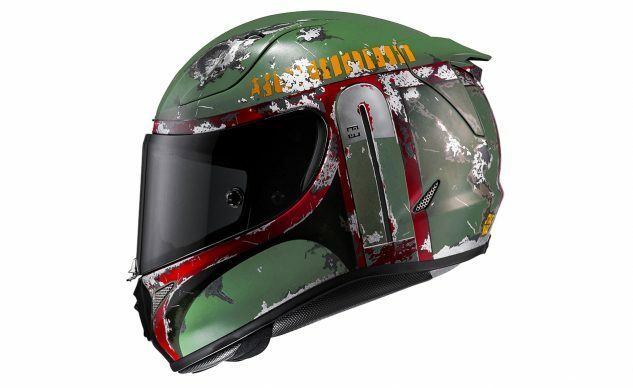 Easier maybe to go with one of the other RPHA 11 Pro graphics packages, of which there are a slew, including this Boba Fett that Toni Elias is wearing in MotoAmerica Superbike this year. All the RPHA Pro 11s are DOT- and ECE-approved, come in sizes XS to 2XL, and have a five-year warranty. Prices range from $409.99 for solid colors up to $599.99 for your Boba Fetts and other Marvelous creations.